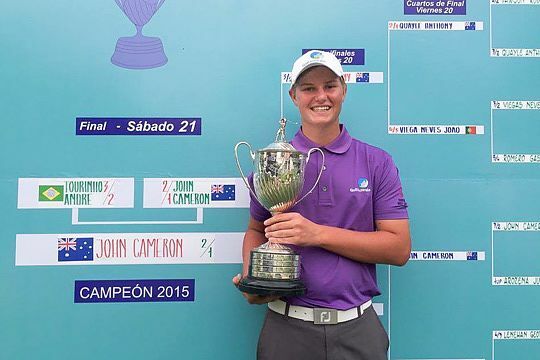 Cameron John’s victory at the 120th Argentine Amateur Championship has sent a clear message that he’s a player to follow in the next wave of talented young guns moving through the Australian junior amateur ranks. John, 16, secured a 2&1 victory over Brazilian Andre Tourinho after disposing of fellow Aussie Anthony Quayle in the semi-final. Winning in Argentina caps off a stellar 2015 season for the Victorian with an amazing seven tournament wins to his credit. Wins at the Victorian Junior Masters, Tamar Valley Junior, Tasmanian Junior Masters, Asia-Pacific Junior, Victorian Boys and the Aaron Baddeley International has seen John being a standout performer in our junior ranks. “It’s been a great year results wise for me,” said John. At 16-years of age John has another year left in the junior ranks, yet has set his sights on playing more major amateur events, both in Australia and in the UK and USA. His goal this year to improve his R&A world amateur ranking – which realistically means doing well in bigger events abroad where the fields are stronger and the ranking divisor higher. John returns to Australia having gained exemption into Australia’s highest ranked and major amateur championship, the Australian Master of the Amateurs, which is to be played 2nd January at The Royal Melbourne Golf Club. The Australian Master of the Amateurs will present John with an excellent opportunity not only to bank some R&A ranking points, but to test his game against a world class field on internationals in his home town.